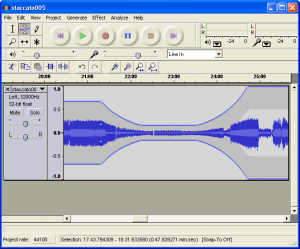 Audacity is an open source, and completely free audio editor that is constantly getting improved with each update. Currently you are able to use an unlimited number of audio tracks, an unlimited amount of effects (with support for VST plug-ins), and unlimited undo, which is very useful. It supports a wide variety of audio formats (including WAV, MP3, and Ogg Vorbis), and is extremely fast and easy to use. At the moment, the VST plug-ins only work in mono, but this program has great potential.